This series of time-stamped posts are from interviews conducted on the 25th of February with various victims of Hungarian police brutality, during two separate crossing attempts on consecutive nights. They were interviewed and recorded on video by a journalist we have been collaborating with, Jaime Alekos, with the support of a translator who wishes to remain anonymous. 00:00 – How many people were with you three nights ago and how many policemen arrested you? 00:03 – We were 15 people in our group, they caught us just when we were waiting for the [smuggler’s] car. First, the helicopter came and then four vans of police came while we were sleeping at night. 00:22 – What was the first thing the police did when they saw you? 00:28 – When the police caught us, they sent us to the police station. Once there, they took off our clothes for checking, we were naked. They told us to dress again and they started beating us, too much. After that, they put us in cold water. 00:58 – How did they beat you? Did they use their hands, feet, batons? 01:02 – They kicked us, punched us and also beat us with batons. 01:08 – Did they only beat you and not the other people? 01:11 – They beat everyone. 01:13 – For how long did they beat you? 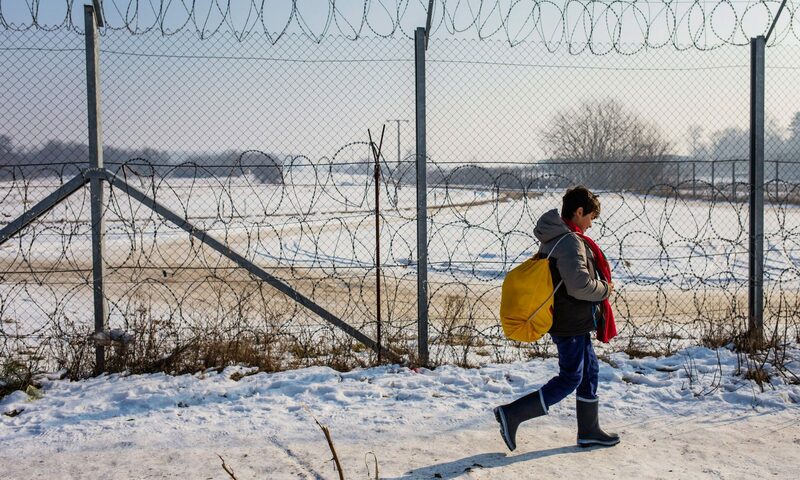 01:15 – They took to the doctor those who were more injured, to put bandages to stop the bleeding and then they took all of us in a van back to the fence, where they took our pictures and sent us back to Serbia through a gate in the fence. 01:33 – This beating was inside the police station? 01:35 – Yes, inside the police station. 01:38 – Do you know in which city or village? 01:41 – In Kelebia, in Kelebia. 01:47 – How was the water? 01:50 – It was cold and they threw us inside. 01:58 – Were you dressed? 02:00 – Yes, they put us in the water with our clothes on. 02:02 – Was the water cold? 02:06 – After that, you were soaked, did they take you like that inside the van? 02:10 – They took us soaked from the water, they put us inside of the police van and they told us not to sit on the seats, but on the ground. When we got to the border they took pictures of us and pushed us back to Serbia. We were wet and they didn’t allow us to sit. 02:25 – They didn’t allow you to dry your clothes? 02:27 – Were you soaked when they pushed you back to Serbia? 02:28 – Yes, they sent us back soaked. 02:28 – Did the police make you sign any document or make any statement? 02:34 – A translator came, he took a statement from us and asked us who is the leader. He asked me who is the leader and I answered I don’t know. He told us: tell me, otherwise I’ll put you in a room and throw the dogs inside. But I told him that I didn’t know. Then he left me. He wrote down our names and then they put us inside the car and took us back to the border.